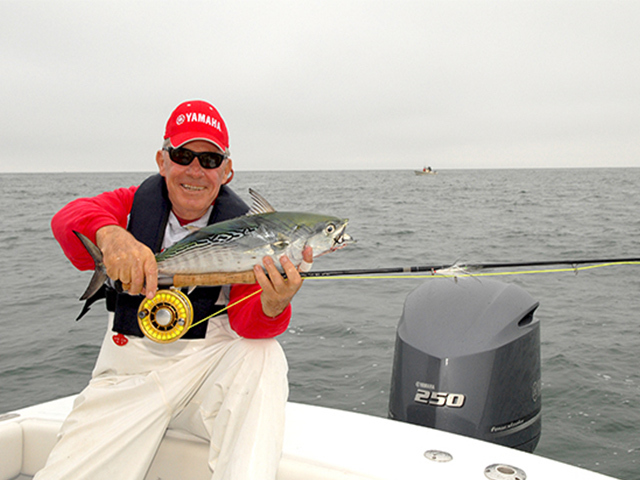 How to use light tackle to target false albacore on the Eastern Seaboard.. The fork-tailed speedster known as the false albacore invades the inshore waters of the East Coast each fall, with action starting off Massachusetts and moving down to the Carolinas. This species is a blast to catch on a 9-weight fly rod. It's usually a run-and-gun fishery as the fish bust large schools of bait. Fish with light tackle and light line, using a fluorocarbon leader tied directly to the running line. Anything shiny will get the attention of a frenzied albie. Albies feed on a wide range of small baitfish including silversides, bay anchovies, sardines, small menhaden and herring. 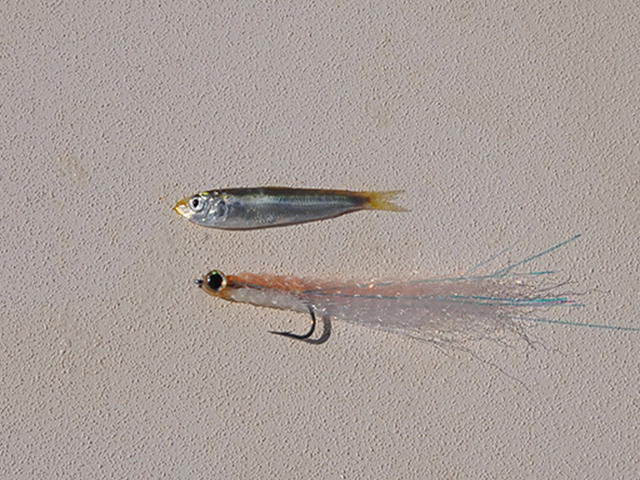 Flies that resemble flashy baits and small lures with lots of movement work well. False albacore fight much like their larger tuna cousins. They don't give up easily and you may need to chase them down with the boat if they really kick it into gear. The beginning of fall means false albacore will start to invade the inshore waters of the East Coast. For light-tackle anglers, albies are a favorite adversary offering fast-and-furious, run-and-gun fishing right off the beach. False albacore, also called little tunny, albies or bonito, are one of the smallest true tunas. While most encountered inshore are in the 3- to 10-pound range, they can grow to weights in excess of 30 pounds. The International Game Fish Association world record was caught on the edge of the Continental Shelf in Washington Canyon, 80 miles off Maryland, and tipped the scales at 36 pounds. The trick to getting the most out of false albacore fishing is to scale down your tackle, hang on and enjoy the ride. Albies are the most abundant tuna species in the Atlantic where they range throughout temperate and subtropical waters, but if you chase them on a regular basis, you might sometimes question that statistic. At times, they appear to be everywhere at once, crashing bait on the surface and at others, they can be almost impossible to find. They range as far north as Maine and as far south as the Florida Keys and throughout the Gulf of Mexico. Albies feed on a wide range of small baitfish including silversides, bay anchovies, sardines, small menhaden and herring. Anything shiny and moving fast with lots of company is a target for these speedy predators. When the false albacore key in on large schools of small baitfish they usually travel in packs, so if you find one, you’ve found a lot. How long they stay in one place is always a contributing factor to how many you’ll catch because they tend to move quickly from one bait school to the next, popping up in a confusion of surface splashes only to disappear almost as quickly as they surfaced. Albies are aggressive when feeding and quick to hit artificial lures, particularly small, shiny metal jigs and flies. What makes them so much fun to catch is their speed and stamina. This migratory species tends to spend much of the winter in their southern haunts, and then begin a northward migration that takes them up the Eastern Seaboard where they provide loads of fishing fun for anglers in Northern Florida, Georgia and the Carolinas. But as they move further north, they tend to push well offshore. By late summer, they will start to move inshore off Massachusetts and Rhode Island where they will hunt bait schools in bays and sounds, around inlets and areas where currents collide. As they begin the fall run southward, they tend to stay closer to shore moving into the Long Island Sound, where they take advantage of massive schools of bait moving out of the many estuaries. October along the eastern end of Long Island offers some of the best albie fishing to be found anywhere, as millions of bay anchovies make their way around Montauk Point right into the path of thousands of albies and small striped bass. The false albacore are so close to the beach that surf fishermen catch them from the rocks. A little later in October, albies show along the south shore of Long Island and the Jersey Coast. The fishing is different, but can be just as frenetic. The parade just keeps slowly moving to the south. The albies will show up off Harkers Island, North Carolina, and do a repeat performance similar to that in Montauk. 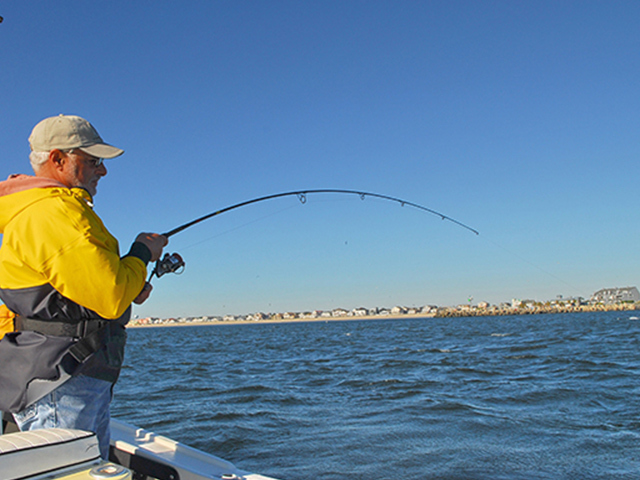 By this time, the action picks up around the Cape Lookout National Seashore by the southern-most barrier island, Shackleford Banks, and around the inner waters of the island itself. The key to their presence is always the same -- massive schools of small baitfish. Most anglers fish for them with light spinning tackle. A 7-foot light-action spinning rod loaded with 6- to 12-pound test does the trick and makes the fight loads of fun. Hook a big one and you just might find yourself starting up the outboard to chase it down. 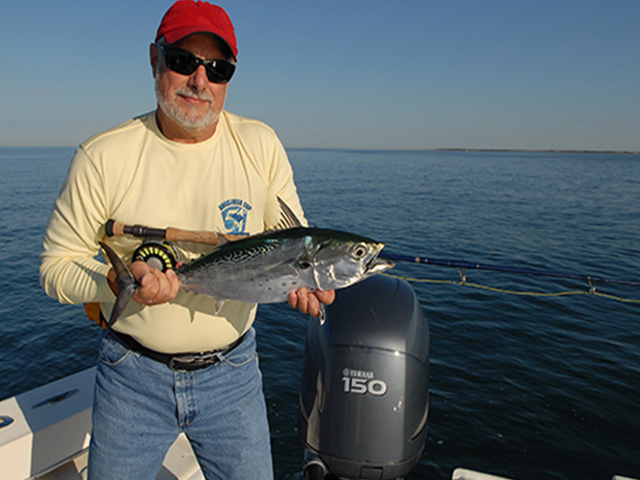 Albies are the ideal inshore fish for fly tackle. A nice 8- or 10-weight rod matched with a quality reel with a super smooth drag that holds at least 300 hundred yards of backing is a must. Floating lines are best for casting to surface-feeding fish, and small flies that match the baitfish will get you plenty of bites. "The key to their presence is always the same -- massive schools of small baitfish." If there are albies around but they’re not surface feeding, you can try chumming. This technique seems to produce best results around nearshore structure such as lumps and ridges. Anchor and cut up handfuls of whatever small baitfish you can acquire. Don’t chum heavily because the fish will hang back and just eat the freebies. Pin a small, light wire hook in a whole baitfish and float it back with a few pieces of chum. You usually don’t have to wait very long for the fish to find you. If you don’t get a bite, try adding a small split shot to the line a couple feet up from the hook to get your bait a little deeper. False albacore have very keen eyesight so keep your terminal tackle sparse and small, including hooks and lures. Don’t use snaps and swivels. Tie your leader directly to your running line, and your lures or hooks directly to the leader. Always use a light fluorocarbon leader, 15-pound test line or lighter, which is far less visible underwater than regular monofilament. If you use braided line on your reel, use at least 10 feet of flourocarbon leader between the end of the braid and the hook or lure. And be sure to check your leader after each fish because they do have teeth and will scuff the line.